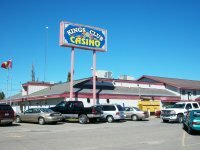 Kings Club Casino is located in Brimley, Michigan with a 7,400 square foot casino floor, 270 slots and one restaurant. Open daily 10am to midnight and no table games. During our 9-18-09 visit the Kings Club Casino was busy and the slots were loose. This is a medium size, slots only casino and we recommend a visit. This is now our favorite casino in Michigan's UP and we now know why this is a locals favorite. It is located right on the water, so enjoy a great view when dinning. The Kings Club Casino is a sister to the Bay Mills Casino and located less than a mile west. One full service restaurant with full menu and optional dining outdoors with lake view.